Part 2 of a 2-part series on the economic importance of coastal restoration to the state and nation. View part one here. The earliest and strongest supporters for restoration were understandably located in coastal areas most directly affected by land loss. Early support also came from businesses that expect to benefit directly from increased spending on restoration. These include the designers, engineers, manufacturers, dredgers, construction and marine transport companies who are making investments to plan for business growth from the influx of billions of new dollars for restoration. At that time, few statewide trade associations or regional chambers of commerce (outside of the coastal parishes) had taken up coastal restoration as a priority issue for their members and customers. Not anymore. Business leaders and economic development groups across the state are increasingly aware of an inescapable economic fact: failure to address coastal land loss presents unacceptable business risks that extend well beyond the coastal areas. More statewide and regional chambers now publicly support coastal restoration and have become actively involved in important policy decisions in this arena. As a marker of widening business support for restoration, 30 statewide trade associations and regional economic development groups signed a July 11, 2017 letter urging President Trump and congressional leaders to protect Gulf of Mexico Energy Security Act (GOMESA) funding that is desperately needed for coastal restoration. The 283 business and civic leaders who signed this letter – spanning the banking, restaurant, real estate, navigation, shipping, ports, manufacturing, builders, chemical and oil and gas industries – all recognize coastal restoration as essential to their economic survival. Over the next 50 years, without coastal restoration, as much as $3.6 billion in Louisiana business, residential and infrastructure assets could be at risk, with an additional $7.6 billion in business disruptions at the national level. These numbers derive from a 2016 study, Regional Impacts of Coastal Land Loss and Louisiana’s Opportunity for Growth, by the LSU Economics and Policy Research Group. Adding to these losses, a single extreme storm could cause statewide damages of $138 billion in assets and $53 billion in economic disruption. Storm damages increase as coastal buffers disappear. Investing in coastal restoration not only reduces business risks of loss; it also provides a consistent flow of funding that supports economic growth and job creation. According to the state’s 2017 Coastal Master Plan, nearly 60,000 jobs will be supported by the levels of restoration funding that are now expected to become available over the next 10 years. 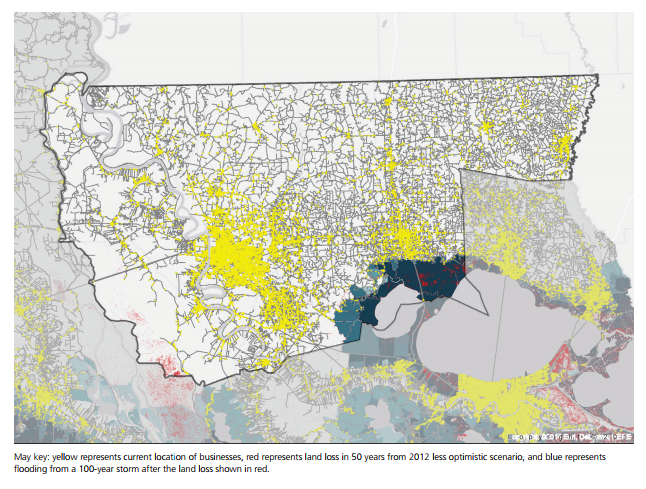 The New Orleans and Houma regions are expected to experience the largest economic risks from coastal land loss. Yet the interconnectedness of business trade patterns leaves no doubt that significant risks also befall other regions like Baton Rouge, Lafayette, Lake Charles and throughout the state. That is why so many different business sectors at the regional and statewide level are now becoming strong advocates for coastal restoration. As noted in part one of this blog series, unabated coastal land loss will have significant and growing economic impacts beyond the state because of the national importance of Louisiana’s commercial fisheries, chemical production, oil and gas, shipping and wildlife tourism industries. These economic activities support jobs across the country and provide needed federal, state and local tax revenues. The U.S. relies heavily on Louisiana for its natural resources and industries that help fuel the nation, making coastal restoration a top priority for the entire country. This is the final installment of our series where our experts answer 10 fundamental questions with new and updated information, so that reasonable and scientifically-sound decisions can be made about the long-term sustainability of the delta and surrounding ecosystems. View an introduction to this series as well as posts on sediment, vegetation, diversions, levees, communities, fisheries, navigation, climate change & energy, and part 1 of economy.